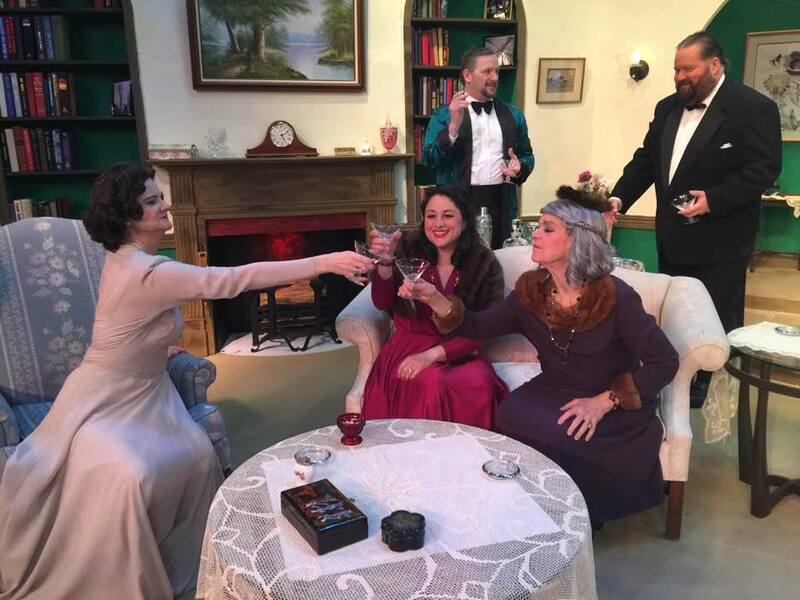 Blithe Spirit is a classic, beloved, and sophisticated black comedy written by one of the great modern playwrights, Noel Coward. Blithe Spirit requires only one (fairly elaborate) box set, but this production will involve some really impressive special effects including flying furniture and books, eerie spirits of the dead, levitating tables, and even a bit of ectoplasm! 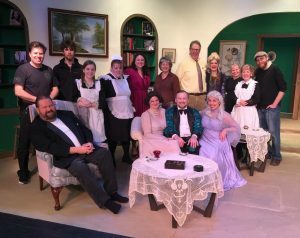 Blithe Spirit, like Arsenic, has been produced at FTG (decades ago), and is well-known to audiences both because it is often produced and also because of the popularity of the movie version starring Rex Harrison (which has a different ending from the play). Charles Condomine, a successful novelist, wishes to learn about the occult for a novel he is writing, and he arranges for an eccentric medium, Madame Arcati, to hold a séance at his house. At the séance, she inadvertently summons Charles’s first wife, Elvira, who has been dead for seven years. Madame Arcati leaves after the séance, unaware that she has summoned Elvira. Only Charles can see or hear Elvira, and his second wife, Ruth, does not believe that Elvira exists until a floating vase is handed to her out of thin air. Elvira is louche and moody, in contrast to the more strait-laced Ruth. The ghostly Elvira makes continued, and increasingly desperate, efforts to disrupt Charles’s current marriage. She finally sabotages his car in the hope of killing him so that he will join her in the spirit world, but it is Ruth rather than Charles who drives off and is killed. Ruth’s ghost immediately comes back for revenge on Elvira, and though Charles cannot at first see Ruth, he can see that Elvira is being chased and tormented, and his house is in uproar. He calls Madame Arcati back to exorcise both of the spirits, but instead of banishing them she unintentionally materializes Ruth. With both his dead wives now fully visible, and neither of them in the best of tempers, Charles, together with Madame Arcati, goes through séance after séance and spell after spell to try to exorcise them. It is not until Madame Arcati works out that the housemaid, Edith, is psychic and had unwittingly been the conduit through which Elvira was summoned that she succeeds in dematerializing both ghosts. Charles is left seemingly in peace, but Madame Arcati, hinting that the ghosts may still be around unseen, warns him that he should go far away as soon as possible. Charles leaves at once, and the unseen ghosts throw things and destroy the room as soon as he has gone.